On a perfectly clear Adirondack evening, the entire Echo Lake community gathered together on Main Camp to watch the World Cup finale. It wasn’t long before pure elation swept across the softball field, and it had nothing to do with Carli Lloyd scoring early and often, or Team USA’s dominating win over Japan. 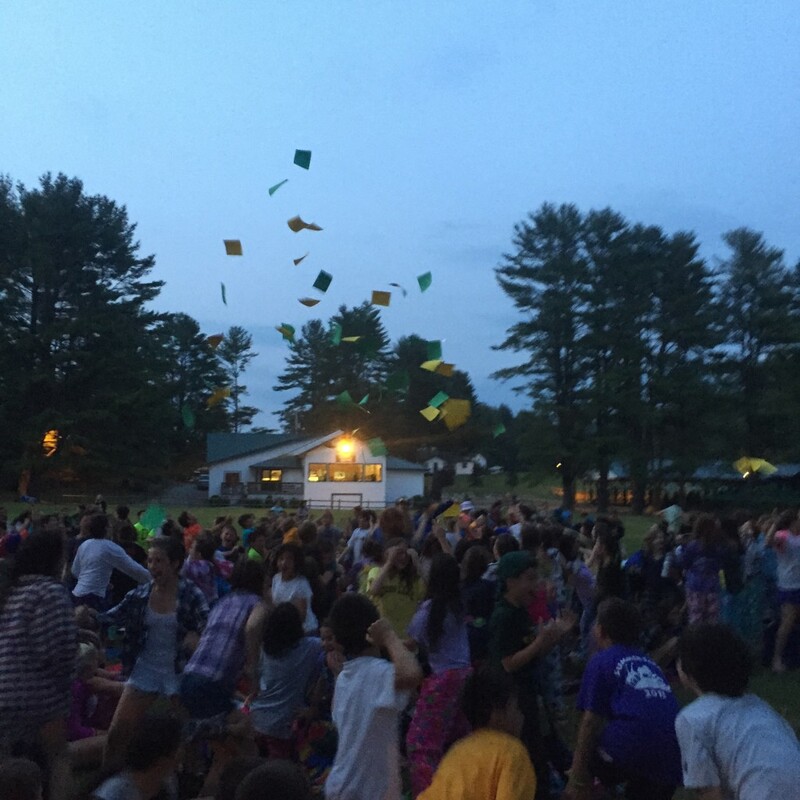 The breaking of Tribal War 2015 tonight created an impassioned frenzy that rivaled the excitement of the World Cup finale that the campers thought that they were going to watch together. At every all-camp event this time of year, campers are on the edge of their seats, ready for Tribal to break at any moment. Before the video showing highlights from this year’s World Cup started playing, the familiar chant – “1,2,3,4…we want Tribal War!” – bellowed from the enthusiastic group of LITs awaiting the opportunity to seize the rite of passage that they have dreamed of for many summers. To them, this is more than just an event to look forward to…it is a privilege that they have earned through hard work and the culmination of a developmental journey. The youngest campers shrieked with excitement when “Tribal” flashed on the screen. For many of them, this is the first chance to experience the magic that goes hand-in-hand with this illustrious event. The rest of the camp cheered loudly as well, especially the LITs, who were overcome with tears of joy and an excitement that simply cannot be captured by words. The LITs made their presence felt in a big way tonight, both in the literal and figurative sense. As each LIT was announced as a Tribal leader, they ran full force into the arms of Tony Stein to celebrate, particularly the four campers who were overwhelmed by the honor of being named Chieftans for their respective teams. One of the best parts of camp is that children get the chance to fully immerse themselves in the moment without any outside distractions. After Tribal broke, even the most diehard soccer fan probably never gave a second thought to the World Cup finale that they didn’t actually get to witness. Tonight was about something bigger than the World Cup. Tonight was about the beginning of something special, where lifetime memories will be created for the Chieftans, the LITs and the rest of the Echo Lake community.